The constant Ebola epidemic outbreaks in Africa arisen in waves of panic worldwide. There is a high mortality rate (30-70%) among the Ebola-infected people in virus- stricken areas. Despite these horrors, the medical capabilities against this deadly viral disease were provided by limited therapeutic agents/options. As a result, several patented agents, biotherapies or prophylactic/therapeutic vaccines need to be reviving into the global markets—including patents of small molecular chemicals, short sequences or oligomers of DNA/RNA, linkages of chemicals with bio-molecules, herbal medicine and so on. In addition, the possible mechanisms of action of these therapeutic options are underway. 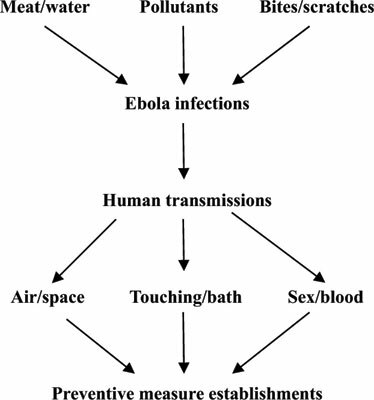 To promote Ebola biomedical study, the multiple characters of Ebola infections—its origin, pathologic progress, genomic changes, therapeutic context and economic considerations are outlined in this review. Finally, a great difference can be expected after these types of efforts. Ebola treatment, virus origin, viral pathogenesis, antiviral drugs, human genomes, traditional Chinese Medicine, drug development, drug patents.